Definition at line 2283 of file xmlstorage.d. Definition at line 2394 of file xmlstorage.d. Definition at line 2385 of file xmlstorage.d. Definition at line 2286 of file xmlstorage.d. Definition at line 2296 of file xmlstorage.d. Definition at line 2303 of file xmlstorage.d. Definition at line 2312 of file xmlstorage.d. Definition at line 2353 of file xmlstorage.d. Definition at line 2317 of file xmlstorage.d. Definition at line 2414 of file xmlstorage.d. Definition at line 2332 of file xmlstorage.d. References xmlstorage::XMLWriter::StackEntry::_children, xmlstorage::XMLWriter::StackEntry::_node_name, and xmlstorage::XMLWriter::StackEntry::_state. Definition at line 2372 of file xmlstorage.d. Definition at line 2365 of file xmlstorage.d. Definition at line 2378 of file xmlstorage.d. Definition at line 2434 of file xmlstorage.d. References xmlstorage::XMLWriter::StackEntry::_attributes, xmlstorage::XMLWriter::StackEntry::_state, and xmlstorage::EncodeXMLString(). Definition at line 2442 of file xmlstorage.d. 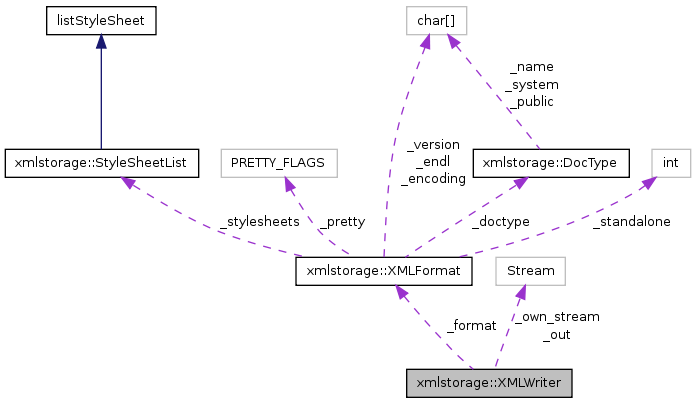 References xmlstorage::XMLWriter::StackEntry::_children, xmlstorage::XMLWriter::StackEntry::_content, xmlstorage::XMLWriter::StackEntry::_node_name, xmlstorage::XMLWriter::StackEntry::_state, xmlstorage::EncodeXMLString(), and xmlstorage::XML_INDENT_SPACE. Definition at line 2421 of file xmlstorage.d. References xmlstorage::XMLWriter::StackEntry::_node_name, xmlstorage::EncodeXMLString(), and xmlstorage::XML_INDENT_SPACE. Definition at line 2392 of file xmlstorage.d. Definition at line 2391 of file xmlstorage.d. Definition at line 2387 of file xmlstorage.d.